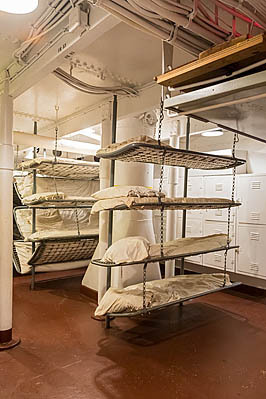 Houston, Texas - Sleeping quarters on the Battleship Texas, which served in World War I and World War II. The vessel is now a museum ship, docked on the Houston Ship Channel. Image Description: Houston, Texas - Sleeping quarters on the Battleship Texas, which served in World War I and World War II. The vessel is now a museum ship, docked on the Houston Ship Channel.